Today’s decision convicting two of Cambodia’s most senior former Khmer Rouge officials for crimes against humanity at the country’s UN-backed Extraordinary Chambers in the Courts of Cambodia (ECCC) is an important step towards justice, Amnesty International said. “Fair and effective trials are crucial if the ECCC is to leave a lasting legacy which strengthens Cambodia’s very fragile judicial system and contributes towards ending the deep culture of impunity. The ECCC,known as the Khmer Rouge Tribunal, today delivered the verdict in Case 002/01, sentencing Nuon Chea, 88, and Khieu Samphan, 83, to life imprisonment. Nuon Chea, the former second in command of the Khmer Rouge regime, and Khieu Samphan, the regime’s former Head of State, faced a number of charges, including the forced movement of the population from Phnom Penh and elsewhere, and the execution of soldiers of the Khmer Republic – the regime topped by the Khmer Rouge. Almost 4,000 victims have been able to participate as Civil Parties in case 002/01, with rights as full parties to the case, including legal representation and opportunities to request investigative acts and call and question witnesses. Before the ECCC, no other international criminal tribunal trying crimes under international law had given victims a formal status during the proceedings. 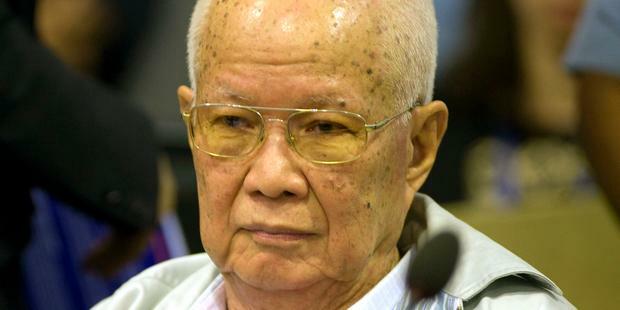 Recognizingthat Nuon Chea and and Khieu Samphan are indigent, the Chamber decided not to order the two men to provide reparation to the victims. Instead, the Chamber endorsed 11 reparation projects which have secured external funding. Two other projects were not endorsed because of insufficient information and lack of external funding. Last week, the ECCC held an initial hearing in Case 002/02, the second case against Nuon Chea and Khieu Samphan, where a wider set of allegations including genocide will be considered. Investigations into two further cases involving a total of four suspects should also be under way, but have suffered from apparent political interference and obstruction that have delayed justice and denied rights to suspects and victims alike.